There are two things that we at Bissell Brothers are always striving for. The first, predictably, is making the best beer that we can. The second is ongoing involvement in our community at large. We decided to combine these two tenets of BBB into a focused program for any employee with a beer idea, a charity they love, and a full day to spend in the brewhouse. And now, you can follow along too! Welcome to the Small Batch Sessions: An ongoing monthly series of small batch beers that will only be available in our taprooms. We will be donating $1000 from each batch to a local cause selected by the employee who brews it. Small Batch Session One is an Extra Special Bitter (ESB for short) brewed by Kevin Broydrick and Samantha Galligan, both taproom workers, with the guidance and wisdom of Patty Mac, aka Patrick McAnany, also known as OG Brewer at BBB. The beer is mysteriously named: Nice One, Sonny. What do they mean by that? Let's find out more. Favorite Animal: Specifically, my cat/son Harry. Broadly, peregrine falcons. Best Recent Vacation: My boyfriend and I went to NYC recently and spent a lot of time at a beer + cheese shop. What a concept! 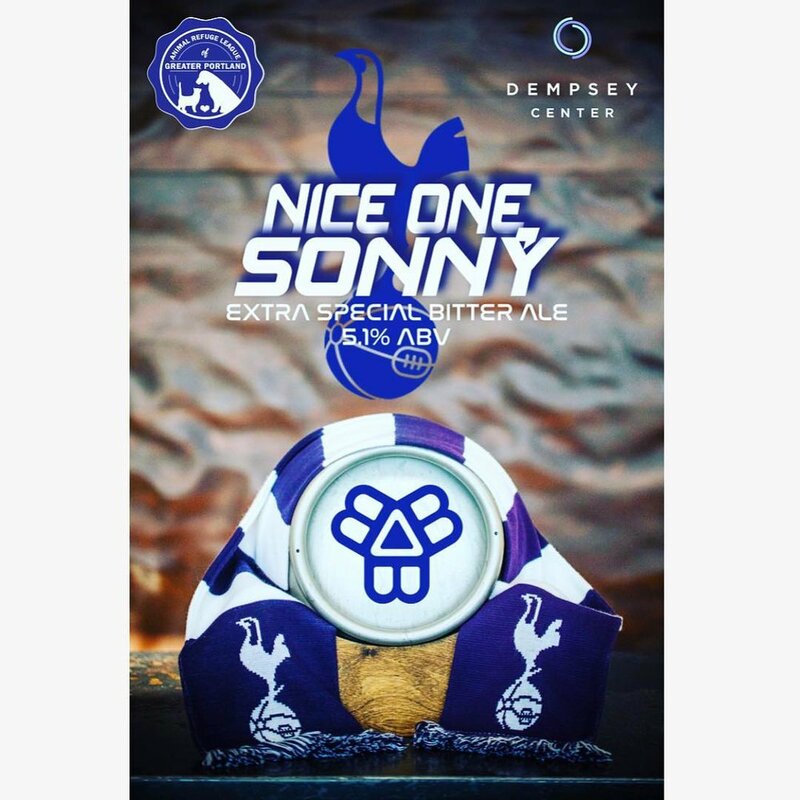 Nice One, Sonny is an Extra Special Bitter brewed as traditionally as we could by using all British malts, hops, and yeast. Golden Promise and a blend of light to medium British caramel malts create a beautiful shade of amber while the combination of East Kent Golding hops and a traditional English yeast strain presents a very pleasant floral aroma and a firm bitterness. We feel this beer is a perfect example of balance. We’ll be presenting this beer from a cask on 03/22 and 03/29, while the remainder of the batch will be served on Nitro pours. Nitrogenation was invented by Guinness in an attempt to mimic the cask experience with out all the headaches involved. While not an exact replication we do find that it is better than pouring with CO2. We hope you enjoy this offering as much as we did creating it. Sam: What inspired you to brew this beer? Kevin: When done well, ESB is a remarkably refreshing and balanced style. There have been lots of examples throughout the history of brewing in Maine, which, early on, was very influenced by the English tradition. In more recent years, traditional English styles have been treated like antiques. I'd love to see a resurgence. Kevin: What's your favorite style of beer to drink, and why? Sam: These days I find myself most thirsty for light, crispy boy pilsners or fruity sours. Pilsners are just so clean and drinkable AND you can have a couple without A. being too hammered or B. being too full. I love sours, I can only assume, because I've always loved sour candy and they are basically a beer version of that. Also, I'm a BIG FAN of Extra Special Bitters. Sam: What makes Nice One, Sonny special? Kevin: Its name is a nod to one of our favorite soccer players, Son Heung-min, who plays for the mighty Tottenham Hotspur. He's a South Korean national and the fans lovingly refer to him as Sonny. The song they sing about him goes "Nice one, Sonny, nice one son! Nice one, Sonny, have another one!" It feels like an appropriate title given the eminent drinkability of ESB. Kevin: If you had to eat the cuisine of one country for the rest of your life, what would it be? Sam: I'll say Japan because: sushi, ramen, and okonomiyake. And also about a billion other things I've never tried, but could happily spend the rest of my life taste testing. Sam: What was something you learned on the actual brew day? Kevin: I got a good education on the process of conditioning and serving beer on cask. It's something I've always been interested in but didn't know much about prior. It's a time-honored technique and I'm excited to be a part of the first cask beer Bissell has produced. Kevin: What is one beer style you'd be fine with never drinking again? Sam: This might be controversial but I'm not a big stout guy!! I've certainly had a few that I've enjoyed but, if I had to vote someone off of beer island...the choice is easy. Sam: Why did you choose your charity? Kevin: My father was diagnosed with brain cancer when I was younger. The Cancer Community Center (now a part of the Dempsey Center) was always a valuable resource for him during his recovery. Having access to community centers like this is a vital part of getting through one of the shittiest times in many peoples' lives. Kevin: What made you choose your charity? Sam: I've always loved animals and have volunteered at a few shelters throughout my life, most recently the Animal Refuge League. Bissell Brothers has done a few events with them over the years, and everyone I've come in contact with at the organization is friendly, knowledgable, and absolutely dedicated to helping animals of all kinds. Their facility is impressive in its capacity to serve animals in need (medically, behaviorally, etc) but also in making the search for a new family member a joyful experience. Their steadfast dedication to animal welfare makes them deserving of any and all help we can give them. Sam: Any ideas for the next beer you brew on the pilot system? Kevin: I like the idea of using the pilot system to stretch out of our comfort zone and experiment with new styles. I've always wanted to brew a Biere de Garde, or a Schwarzbier. It's awesome that we have access to this system to indulge our curiosity! Kevin: What are your thoughts on our finished product? Sam: I'm excited to be able to provide a beer in our tasting room that maybe not many people have had before, and to have it available in a couple different vessels. I'm looking forward to comparing the differences between the nitro pour and the cask pour, and seeing which one people prefer. And the extra special glassware! Nice One, Sonny will be pouring at Bissell Brothers Brewing starting on Friday, March 22. Come on down, try something new, and support a couple great causes with us!